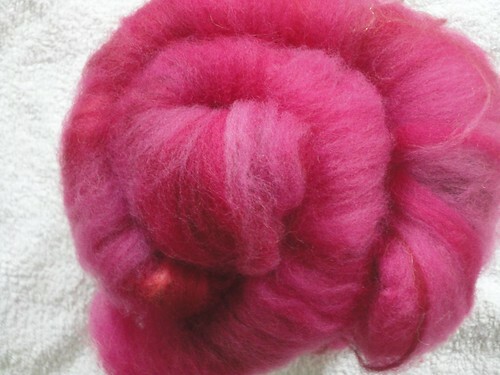 Recently I attended a drum carding workshop where we made some batts to use for spinning. It was a lot of fun and I enjoyed the process tremendously. These are the two I made. I’ve had a bit of waiting time lately, so my carry along project is coming along well. This weekend we had an end of year function. 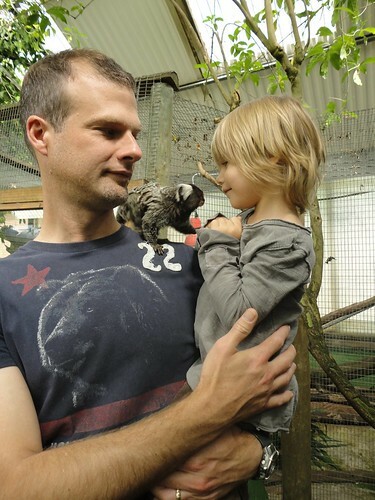 The function was at a butterfly park and so we went a bit early to have a look around. Gorgeous Man made a friend. 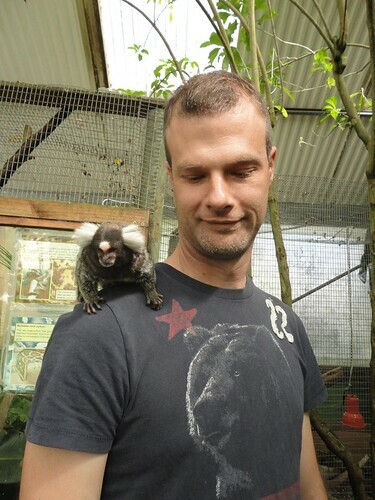 This little fellow jumped first into my lap while I was squatting down to take its picture and then leapt onto Gorgeous Man. Gorgeous Girl insisted that she be allowed to get up close and personal as well. I finally made an appointment with the oral surgeon that my dentist referred me too, and I’m going to be having all 4 of my wisdom teeth out in 10 days time. I’m not looking forward to that. They have to do it under a general anesthetic and the surgeon is predicting 5 days off work for recovery. 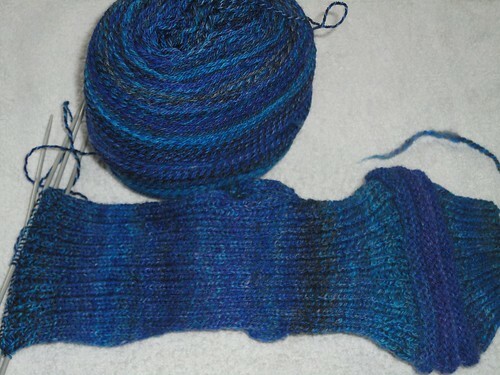 There’s been some secret knitting going on for my friend Kerin so I can’t show you that until it is delievered. Mum is going to play courier when she comes at Christmas time. 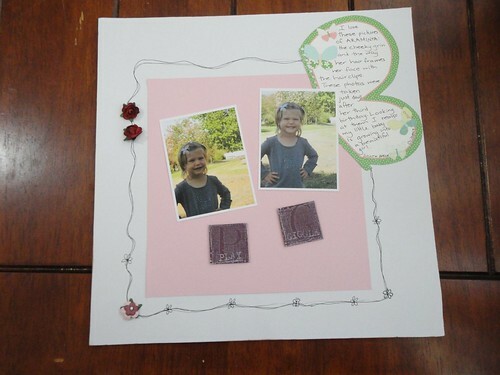 There has also been some secret scrapbooking going on. But here is a recent page I can show you. Speaking of embellishments. I’m looking for some with a Dutch theme so that I can scrapbook our trip earlier this year. If you have access to some and would be interested in a swap let me know. 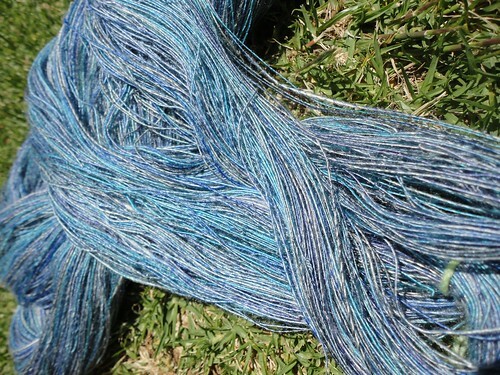 I’m happy to trade handspun yarn, fibre or fabric (no point in trading scrapbooking stuff since 99% of the stuff available here is imported from the USA). 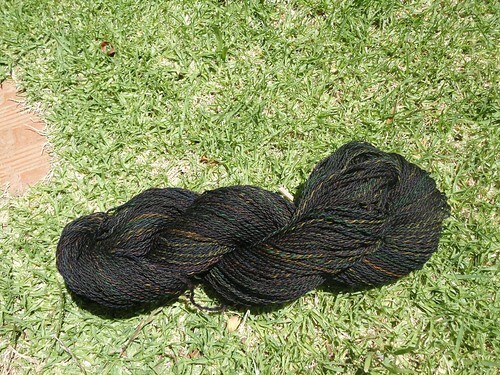 This is telling me that it wants to be a Traveling Woman shawl. 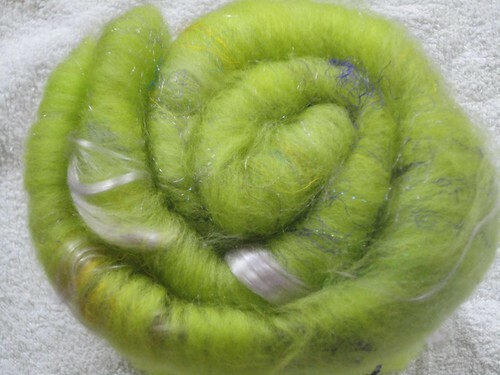 This was my club fibre from Nurturing Fibres winter fibre club. First a picture for my friend Kerin. 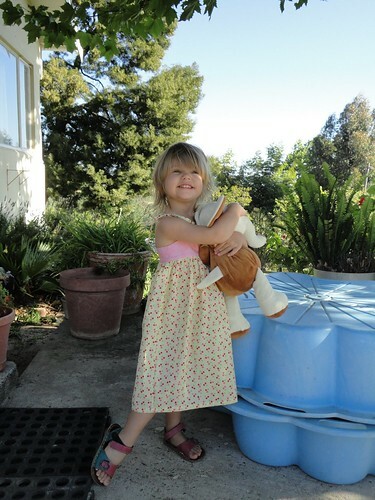 Kerin made this dress for Gorgeous Girl a while ago and it is finally hot enough for her to wear it (we’ve had a very long winter this year). She wore it out to dinner yesterday and looked adorable. She loves it Kerin and when I got it out of the wardrobe she said “Oh my cherry dress from Aunty Kerin” which was very cute. 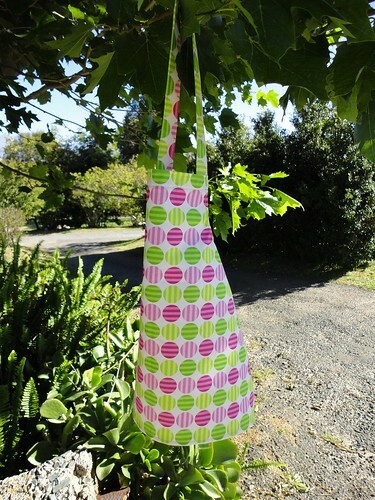 Ever since making an apron for Gorgeous Girl to use at school she has been asking for one for home. On Sunday she chose some fabric from the stash and I whipped this up. 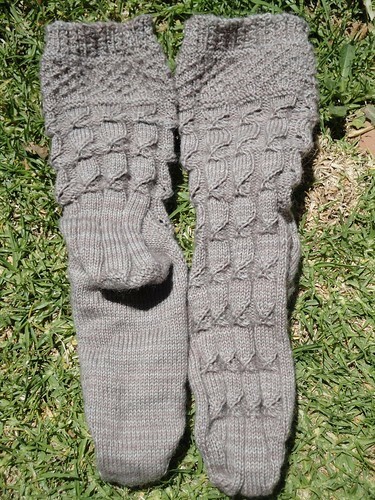 I participated in the Through the Loops Mystery Sock Knit Along again this year. Fun pattern turned into a lovely pair of socks. 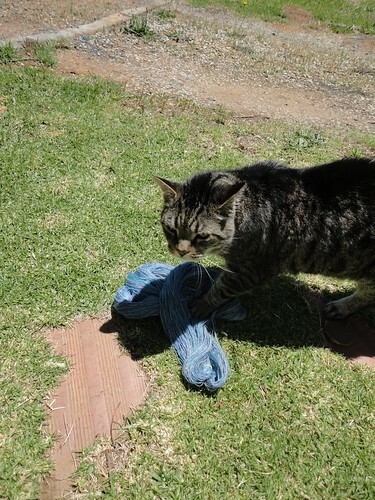 Yarn is from Nurturing Fibres. But I couldn’t resist this beauty and she has come home to live with me. I had a quick spin on her before I bought her and today she got oiled in all the right places. I’m hoping to give her a proper workout later. 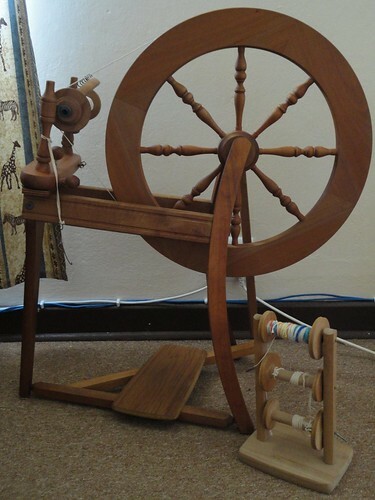 It’s an Ashford Traditional and already she has taught me some things about my Ashford Traveller that I didn’t know. I’m lucky to have met some very talented people here in South Africa. 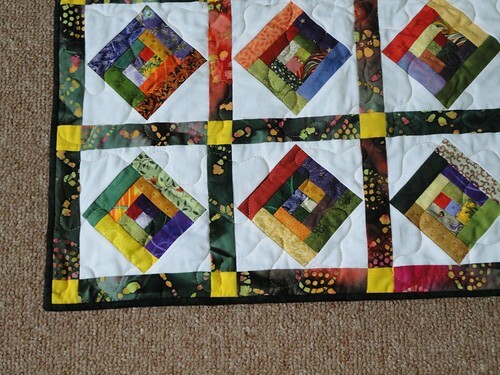 One of the most talented and prolific quilters I know is my friend F. An embarrassingly long time ago she gifted me with some little squares. The centre of the logcabin block was 1 inch cut. Pause to consider the implications here…The rest of the block finished at 4 1/2 inches and the strips were 1 1/2 inches cut. I added some triangles to make a square in a square and some sashing and ended up with this. My long armer has closed her business and retired to the UK. The fabric store side of her business I can live without, I don’t know what I’m going to do for a quilter now though. This has been finished for quite a while, but I’ve had problems getting decent pictures. 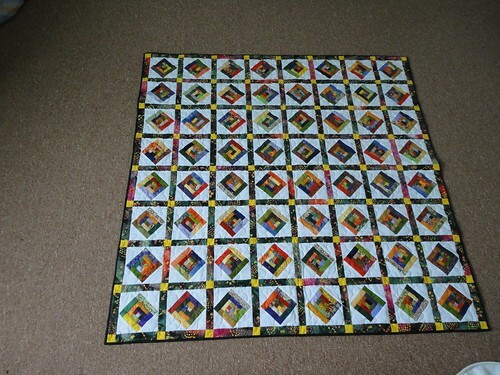 Eventually I just decided to show you the quilt using pictures that weren’t blurry. Another very talent person I know is thewren. I’ve been wanting one of these bags since I first saw the prototype being tested by one of my colleagues. 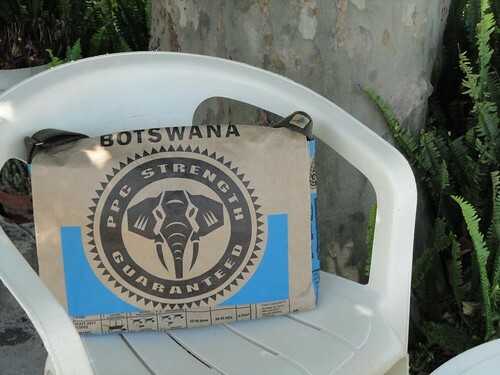 It’s made from a cement bag. Here is a link to more pictures. The third talented person is my fibre dealer Carlé. This is my latest spin from her. And this is what happened within 5 seconds of taking that picture. The cat tried to claim it as his own.